No matter where you are in life, making plans decades in advance can seem like a complicated journey into uncharted waters. We get that, which is why your Shorepoint wealth advisor makes that journey easier by breaking it down into a series of simple steps. Your Goals. Your Plans. Your Assets. Shorepoint’s goals-based wealth planning approach is designed to identify the investment strategy that has the highest probability of meeting all your financial objectives over short-, medium- and long-term time horizons and across a variety of market conditions. During that process, your wealth advisor will perform several “what if” analyses that will help you visualize the tradeoffs among risk, return and achieving your goals and give you the information you need make an informed decision about the best plan for you. Identify your short- and long-term goals. Consider other circumstances, such as outside assets and closely held businesses. 6-Step Goals-based Wealth Planning Process. 1. Define your immediate- and long-term wealth objectives, including future income needs, major purchases or expenses, retirement lifestyle, philanthropic goals and/or leaving a legacy for heirs. 2. Create a personal statement of net worth as a baseline. 3. Assess probability of success for achieving your objectives based on realistic “what if” scenarios, market simulations, investment strategies and time horizons. 4. Continue to refine assumptions, tweak goals and reassess acceptable risk until we identify the investment strategy that gives you the highest probability of reaching your goals. 5. Codify your customized wealth plan and investment strategy into formal, client-approved Investment Guidelines. See a Sample Client Financial Plan. 6. Implement investment strategy, monitor and rebalance as needed. Schedule ongoing reviews. Learn more. Life changes and so do your circumstances and goals. 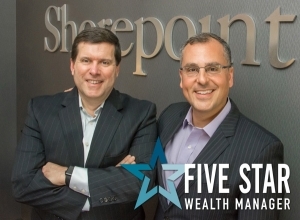 Your Shorepoint advisor will be proactive in reaching out to see how you’re doing and whether we need to revisit your wealth plan and investment strategy. At least once a year—and typically more often—we’ll review your initial plan and formal Investment Guidelines with you and make any adjustments necessary to ensure your continued financial well-being. Actively working as credentialed professionals in financial services for at least 5 years.